Last week in The Scream Heard Around the World, we looked at how one Cuban raised his voice and instigated a war that defeated Spanish occupation in two island nations half a world apart. Today, we look at U.S. involvement in that war, and the impact of one man’s poetic farewell. On April 20, 1898, the U.S. delivered an ultimatum demanding that Spain leave Cuba. On April 25, Spain formally declared war on the U.S. Given the poor state of repair of the Spanish naval forces in the Caribbean and in the Philippines, the U.S. Navy was able to conduct successful blockades. A U.S. Navy task force lead by Commodore Dewey destroyed the entire Spanish fleet in Manila Harbor in the Philippines on May 1, 1898, without any significant damage to the U.S. ships. The revolutionary movement was encouraged by the Spanish naval defeat. The exiled Aguinaldo was invited back to the Philippines by the U.S. government. Dewey’s force remained in Manila harbor, waiting for a U.S. Army corps consisting mostly of new volunteers to arrive on the scene. Nineteen days later, Aguinaldo arrived in the Philippines and, to the disappointment of the U.S., instituted a dictatorship. 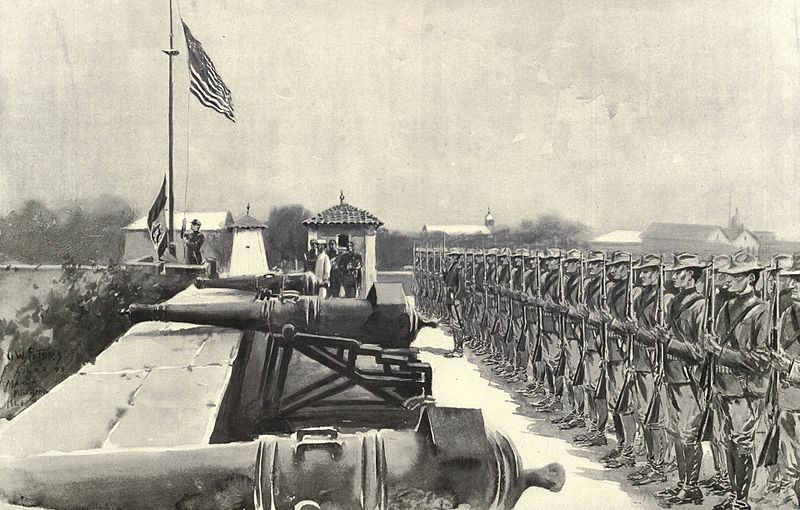 Philippine forces surrounded the Spanish Army in Manila. While Dewey waited for U.S. Army forces to arrive, the U.S. Navy quickly annihilated the Spanish squadron in Cuba. U.S. Marines and the U.S. Army, in conjunction with the Cuban Liberation Army, defeated the Spanish forces. As Americans had expected, the U.S. government demanded independence for Cuba. On August 12, 1898, Spain and the U.S. signed a cessation of hostilities in anticipation of an eventual peace treaty. Spain granted Cuba full independence and agreed to withdraw from the Philippines. In the meantime, the U.S. Army had arrived in Manila Bay. One of the senior commanders among the new arrivals was a brilliant officer named Arthur MacArthur. His son Douglas would one day play an important role in Philippine history. On August 13, unaware that a peace accord had been reached between the U.S. and Spain, the opposing armies in Manila conducted one of the strangest battles in their respective histories. The Spanish garrison knew that it could not hold out for long without reinforcements or resupply. They feared that the Philippine revolutionaries would enact bloody reprisals against the Spanish civilians in Manila. Commodore Dewey was sympathetic to their concerns and managed to get the Spanish to agree to what was, in fact, a well-directed drama performance. In a prearranged fake battle, the U.S. forces went ashore and took Manila while simultaneously managing to keep the Philippine troops from entering Manila. In what had to be one of the greatest acting performances in history, the U.S. forces occupied Manila with only a few casualties on either side. The Spaniards were able to explain to their government in Madrid that they had put up an honorable resistance against overwhelming odds. By the time the Philippine revolutionaries realized what had happened, the U.S. forces had taken solid control of Manila and were able to enforce order. Aguinaldo and his followers rightly grew suspicious. Whereas the U.S. public sentiment had always been in favor of Cuban independence, most Americans knew little about the Philippines and considered it a distant land occupied by exotic savages. The general assumption, thanks in large part to the U.S. press, was that those angry savages in the Philippines could not possibly govern themselves. The U.S. was, in fact, hoping to take possession of the Philippines as new colonizers. Most of the public rationalized that this would be an act of kindness toward the “helpless savages.” Not all Americans agreed, and an anti-annexation faction led by Andrew Carnegie and Mark Twain protested against the U.S. intentions to annex the Philippines. On December 10, 1898, in the final peace agreement, the U.S. paid Spain $20,000,000 for Guam, Puerto Rico, and the Philippines. Aguinaldo and his supporters were not amused. War broke out between the Philippine revolutionaries and the U.S. occupation force on February 4, 1999. The U.S. Army was better equipped and well supplied, but it took them two years to put down the insurrection. Cooper asked his fellow congressmen if those were the words of a savage or a brilliant man. His fellow congressmen were touched by the poem. In minutes, their sentiments shifted significantly. The Philippines were not granted their independence, but an administration was installed with the intention of preparing the Philippines for self-governance. The enabling bill included a provision for the Philippine Assembly, allowed for two Philippine delegates to the American Congress, and most importantly, it extended the U.S. Bill of Rights to the Philippines. The U.S. did not grant complete independence until July 4, 1946, by the Treaty of Manila. With decades of bloody fighting, the people of the Philippines had not been able to achieve their goal of independence. With his final words, their most beloved native son, the gentle doctor José Rizal had given them their freedom. Before the people of the Philippines could fully exercise their freedom, tragedy would come to their land in the form of a Japanese invasion. But that is a story for our next installment. Pearl of the Orient seas, our Eden lost! Still would I give it thee, nor count the cost. ‘Tis ever the same, to serve our home and country’s need. To dye with its crimson the waking ray. No blush on thy brow, no tear in thine eye. And sleep in thy bosom eternity’s long night. The touch of thy tenderness, thy breath’s warm power. Let it trill there its hymn of peace to my ashes. From thee, O my country, that in God I may rest. And then for thyself that redemption thou mayst gain. ‘Tis I, O my country, raising a song unto thee. Before into nothingness at last they are blown. Ever repeating the faith that I keep. Where faith can never kill, and God reigns e’er on high! Friends of my childhood in the home dispossessed! Give thanks that I rest from the wearisome day! Beloved creatures all, farewell! In death there is rest! English translation by Charles Derbyshire. It is a rare treat to read a poem translated from Spanish that sounds as eloquent as it was originally written. I can see how José Rizal’s poem would move people. Also, thank you for the reminder that Gen. Douglas MacArthur’s father played a significant role in the U.S.’s involvement in The Philippines. Hi Mike. I respectfully salute your father’s memory. To survive the Bataan Death March and years of brutal treatment at the hands of the Japanese army he had to be remarkably tough. My father also fought in the Philippines. He entered Luzon Island prior to MacArthur’s return to the Philippines.